When I see contrails crisscrossing the sky, I wonder what the skies over Europe looked like during World War II. So many military aircraft were flying back then, heavy bombers, medium bombers and fighters. 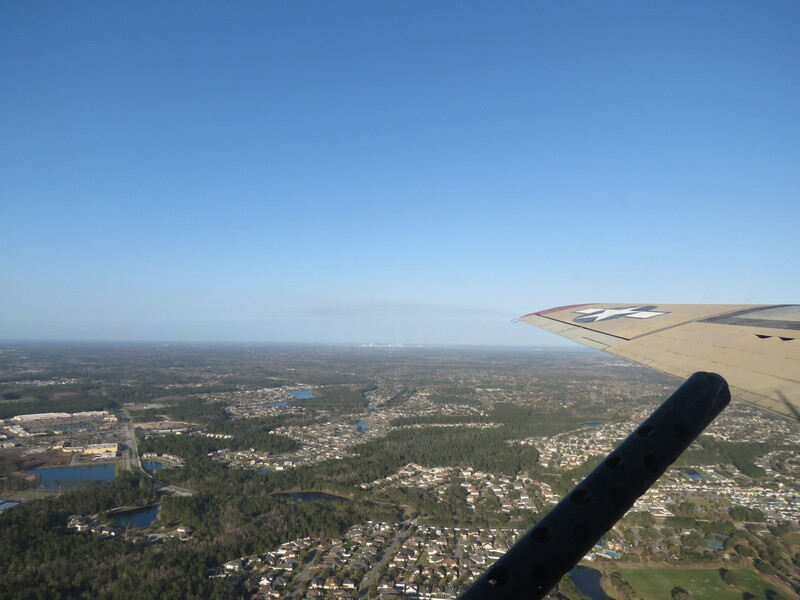 Without today’s on-board radar, clear skies provided ideal flying weather for the bombers and a clear, blue sky is a perfect backdrop for snowy-white contrails. The U.S. Eighth Air Force flew daytime missions over Europe beginning in 1942. While the British flew at night, the Americans tackled the more dangerous daylight hours. Even during the Luftwaffe’s infamous blitz in 1940, the Germans dropped their bombs at night. They knew their bombers were much more vulnerable in the daytime. 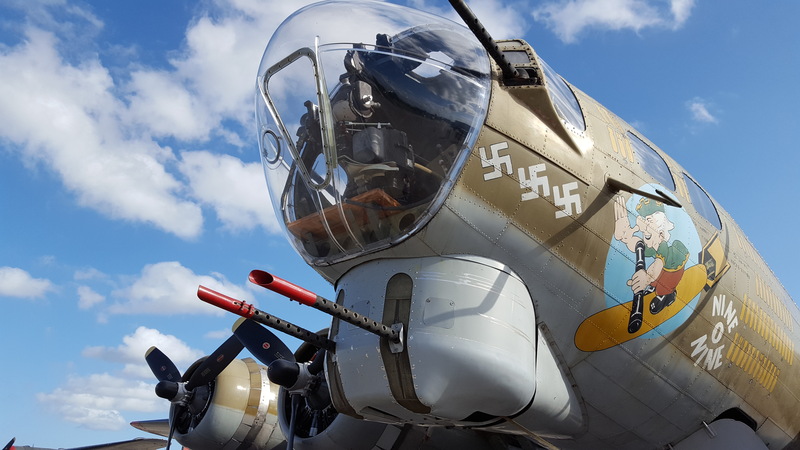 But the Americans believed that their heavily armed B-17 “Flying Fortress” and the comparably armed Consolidated B-24 could withstand German fighter attacks without the protection of their own fighters. It would be late in 1943 before long-range fighters would accompany the bombers all the way to the target and back. The Americans also believed that by flying in the daytime their bombardiers could be more accurate. 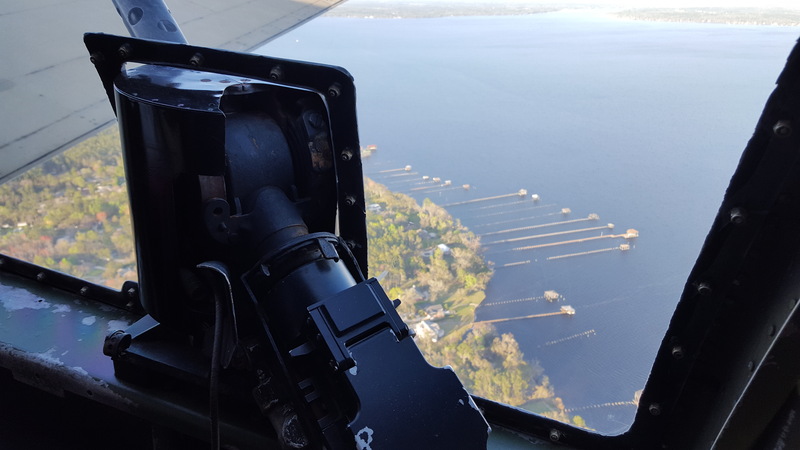 The top-secret Norden bomb sight enabled the bombardier to hit the selected target with less damage to nearby non-military structures. At least that was what they believed at the time. Later they found that although the U.S. bombings had less collateral damage than the British “carpet” bombing, their accuracy left much to be desired. Also, the American losses due to anti-aircraft fire or “flack” were horrendous. But let’s get back to those contrails that marked the path of bombers across the sky. 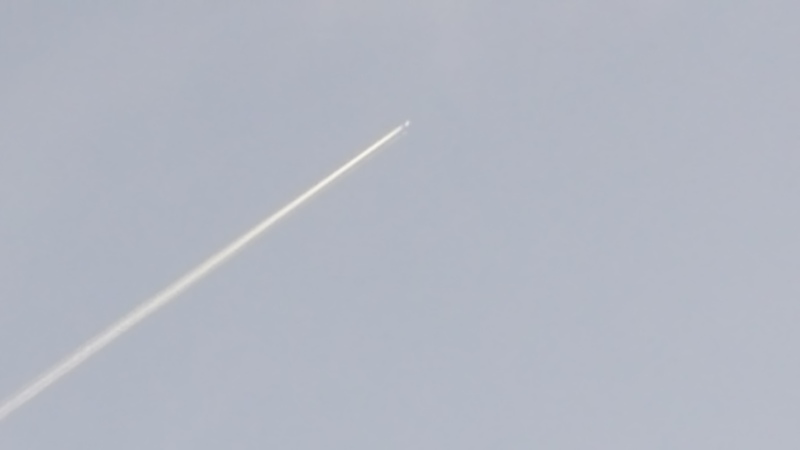 Contrails are a phenomenon of atmospheric conditions. When the heat from airplane engines interacts with the moist atmosphere at high altitudes and when the temperature and humidity are within certain ranges, a contrail (essentially a cloud) is formed. Engine emissions facilitate the cloud or contrail formation by providing tiny particles for the moisture to gather around. 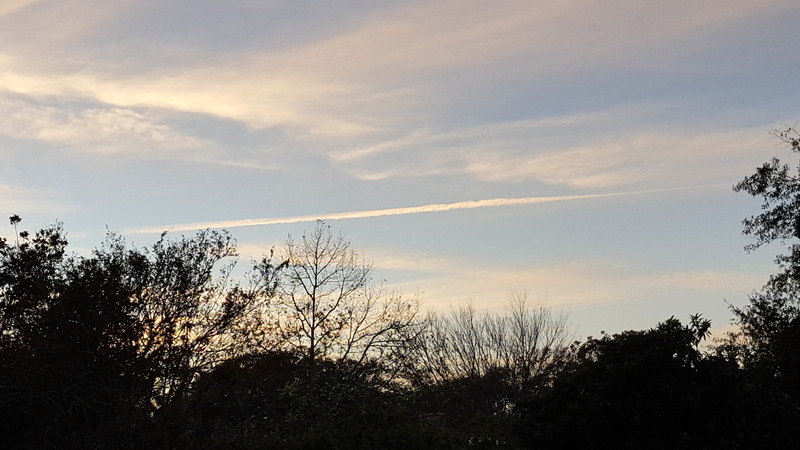 Depending on conditions at altitude the clouds or contrails may quickly disappear, may hang in the sky as long thin lines or may spread out into what eventually appear to be natural bands of billowy clouds. 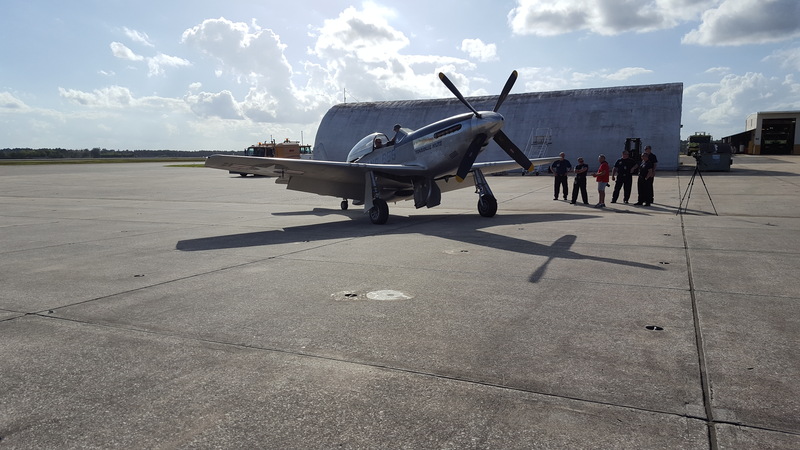 Today’s contrails are produced by jet engines, but during World War II airplanes were powered by internal combustion engines. These engines produced enough heat to create the contrail phenomena. When squadrons of bombers stacked into box-like formations sped across the sky, their contrails must have been a sight to see. Instead of one solitary streak across the sky, groups of pencil-thin clouds would have marked the squadron’s progress. 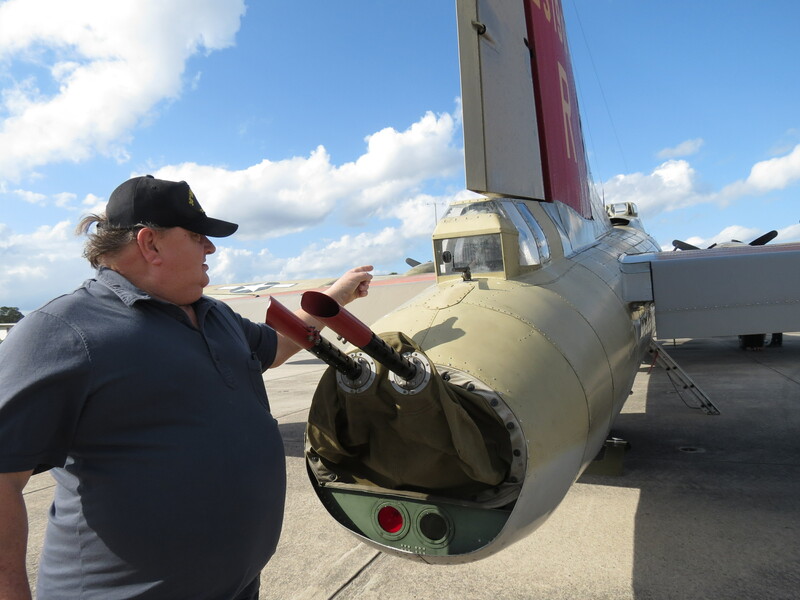 When the humidity and temperature were right, these bombers could not hide from the enemy. Germans on the ground could easily track their direction and note when the group changed course. 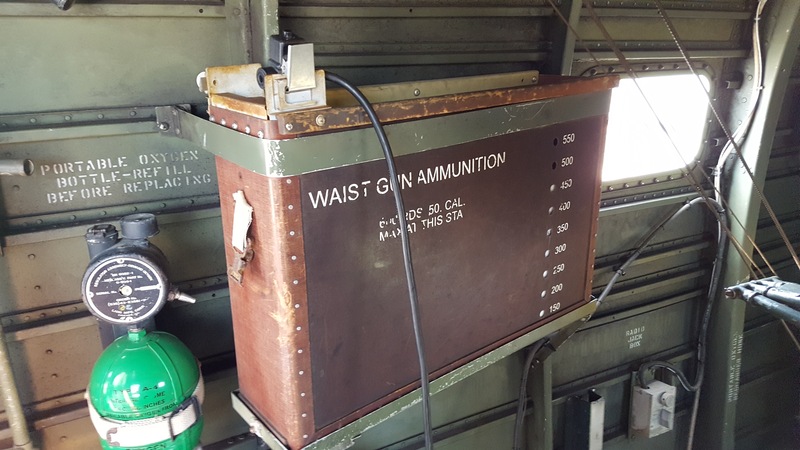 It was no wonder that the anti-aircraft fire was so deadly accurate. Conversely, the streaks across the sky must have comforted those in occupied countries as the American bombers flew over France, the Netherlands, Belgium, Denmark and Luxembourg. 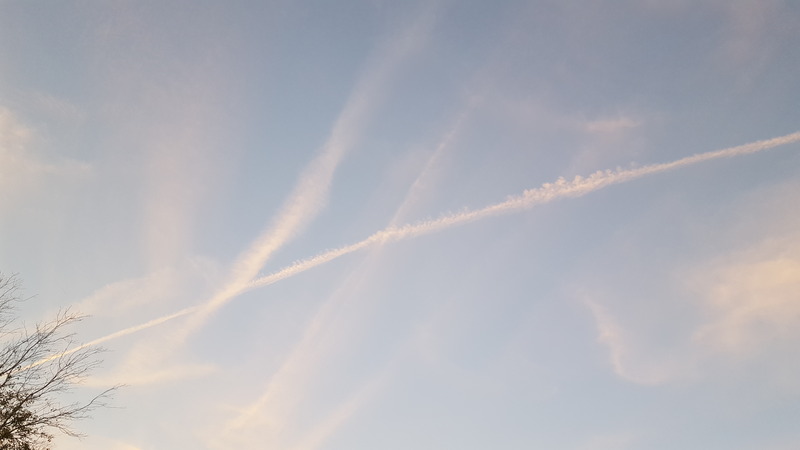 In the dark years of 1942 and 1943, when the Germans dominated Europe and the Allied forces were far away in North Africa and Sicily, these contrails provided hope to the people of Europe. Their message written across the sky said that Europe had not been forgotten. 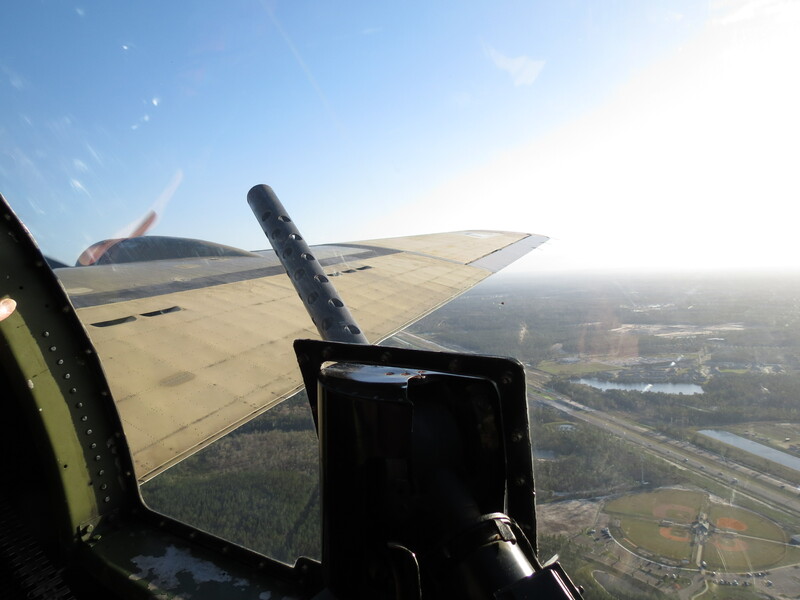 Learn more about the Eighth Air Force and their war over Europe by visiting the Mighty Eighth Air Force Museum just outside Savannah, Georgia. It is a fascinating place to visit. And read about the men in those bombers in my novel, Kitty’s War, which will be released on Friday, December 16, 2016, published by The Wild Rose Press and available at Amazon and other online stores. 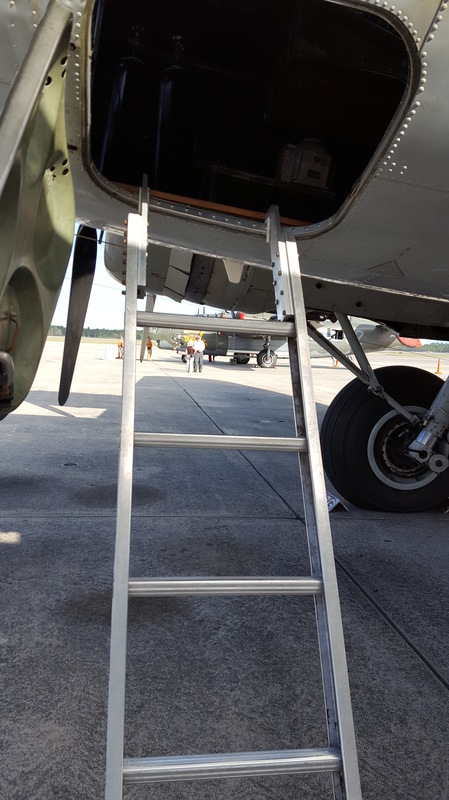 We recently traveled to Savannah, Georgia, and decided to stop in at the Mighty Eighth Air Force Museum. It is right off I-95 at Pooler, Ga. I’d seen their website but wasn’t sure what to expect. Wow! Were we impressed! The museum is housed in a beautiful facility that includes the extensive exhibits, research facilities, gift shop and a small cafe. The fees are extremely reasonable, especially since you could spend an entire day and not see all the exhibits. 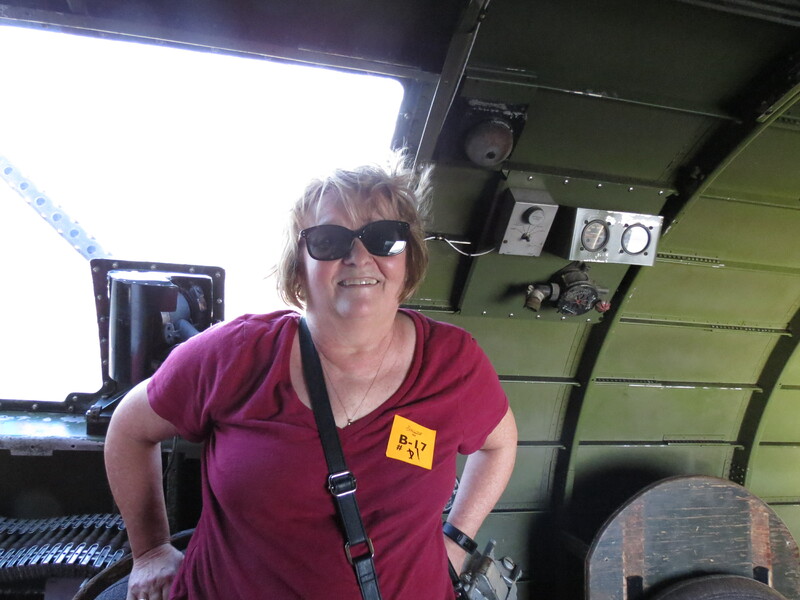 For anyone interested in World War II or in the history of the U. S. Air Force, this is the place to visit. 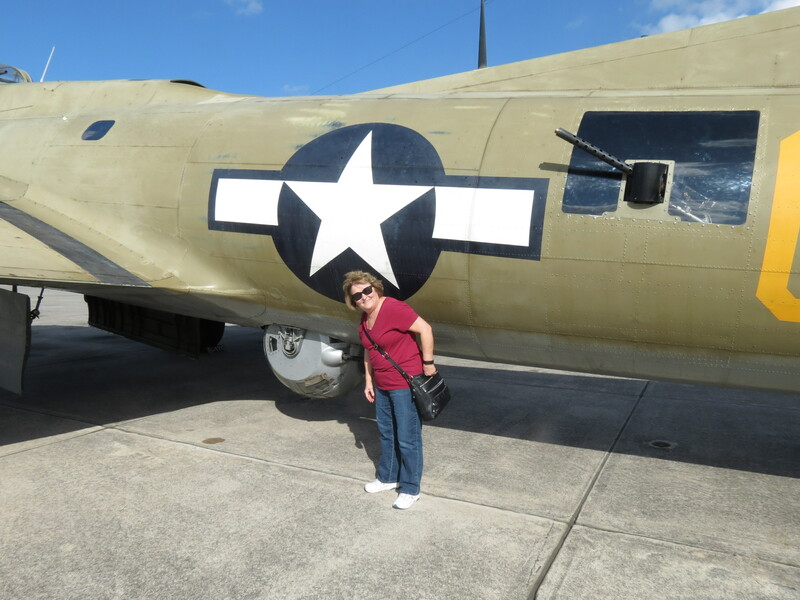 With the research that I have done on the WWII era for my novels, I probably knew more about the 8th Air Force than most visitors. Both my husband and I have always had an avid interest in the Second World War, the politics, the fighting, the men and women who fought, and those who stayed behind on the home front. 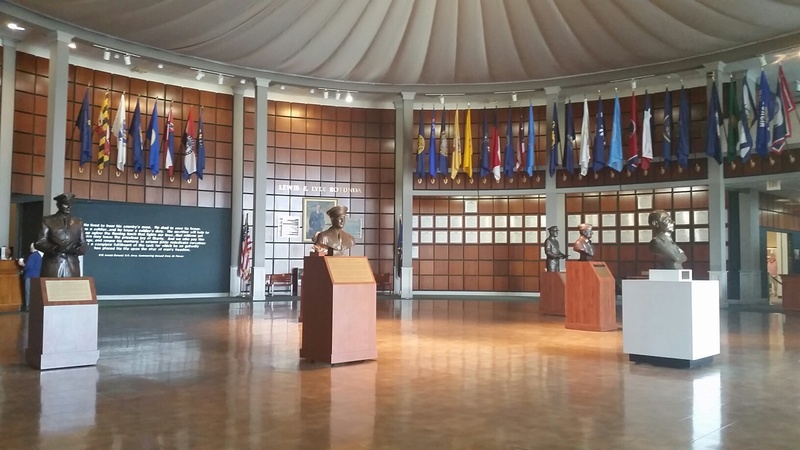 We went from exhibit to exhibit looking at the artifacts and reading the explanations starting in the rotunda where busts of important 8th AF individuals include Jimmy Stewart, the actor/movie star who piloted a B-24 on missions over Europe, and Jimmy Doolittle, who gained fame by leading the raid on Tokyo before taking command of the 8th. The exhibits are set up so that the visitor is led through the war starting with the events that led up to the U.S. involvement. 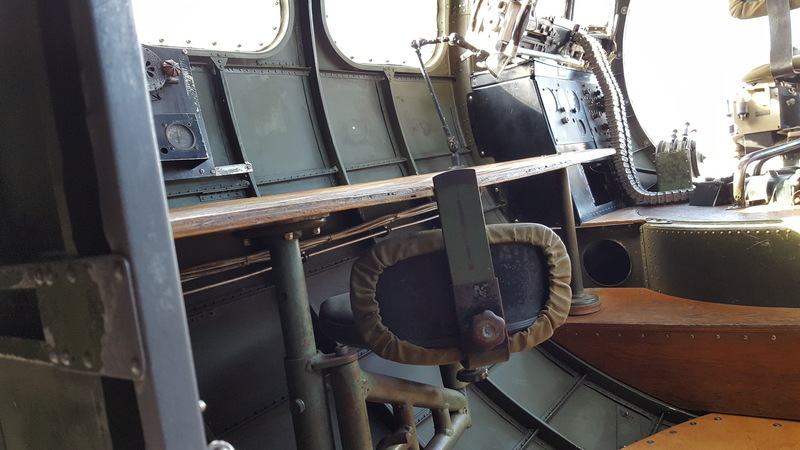 The origin of the 8th Bomber Command in January, 1942, just a month after the United States had declared war on Japan and Germany, at Hunter Field in Savannah, Ga., explains the museum’s location. In February, 1942, the 8th relocated to England where the English assigned them to air fields in southeastern England. Later, in February, 1944, the 8th was redesignated the 8th Air Force, still part of the Army Air Corp. The war would be over before the Air Force would separate from the Army as a separate entity. In 1942 the 8th began flying missions over German occupied Europe. During the next three years the 8th would suffer more than 47,000 casualties, over 26,000 deaths and its men would be awarded numerous medals including seventeen Medals of Honor. 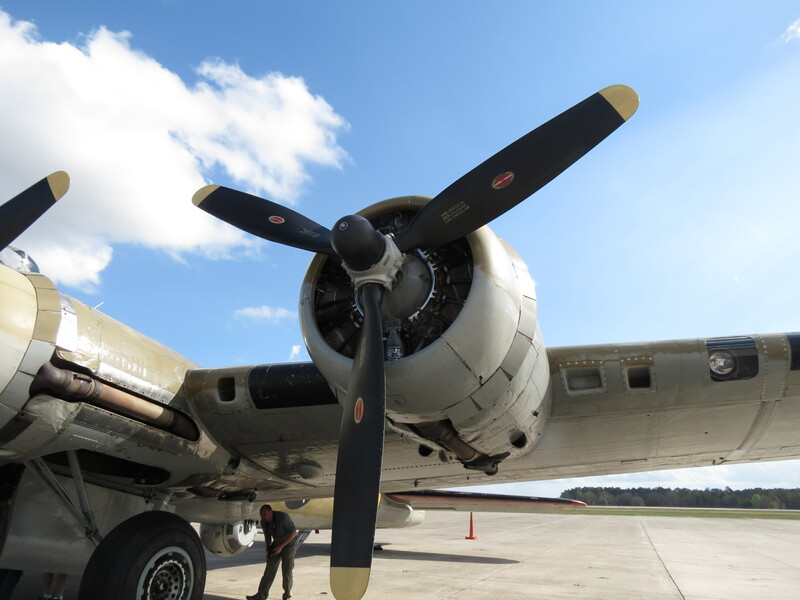 One of the most impressive exhibits is the B-17 bomber currently being restored named the City of Savannah. The plane takes up an enormous exhibition space. 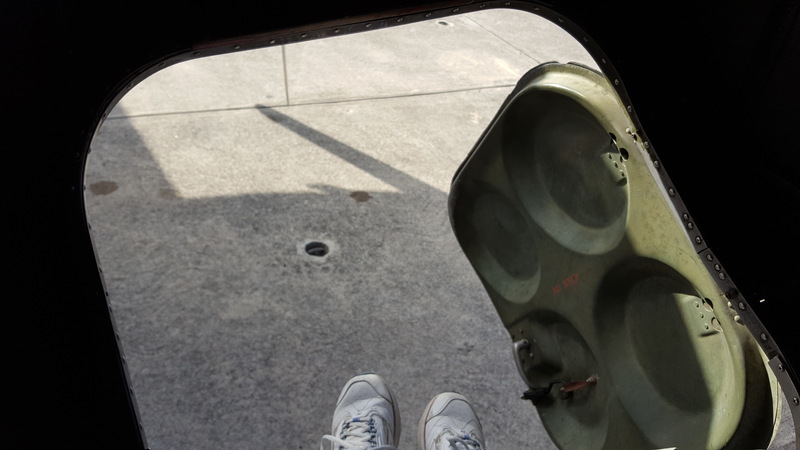 Although it is not open for visitors to climb aboard, just walking under its huge wings gave me goose-bumps. 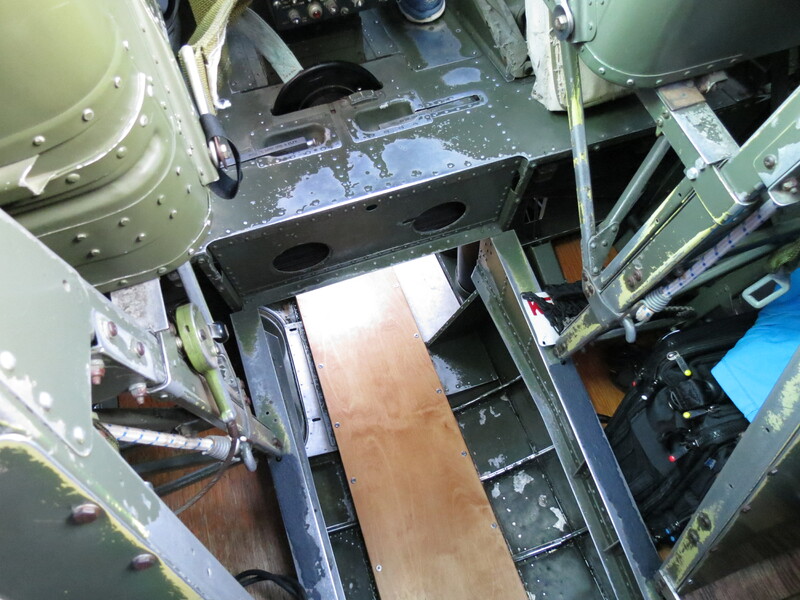 You can see the engines up close, read and watch videos of each crew members responsibilities, step inside a booth to experience the waist gunner’s position, and look in the ball turret to wonder how a grown man could fit in the small space. 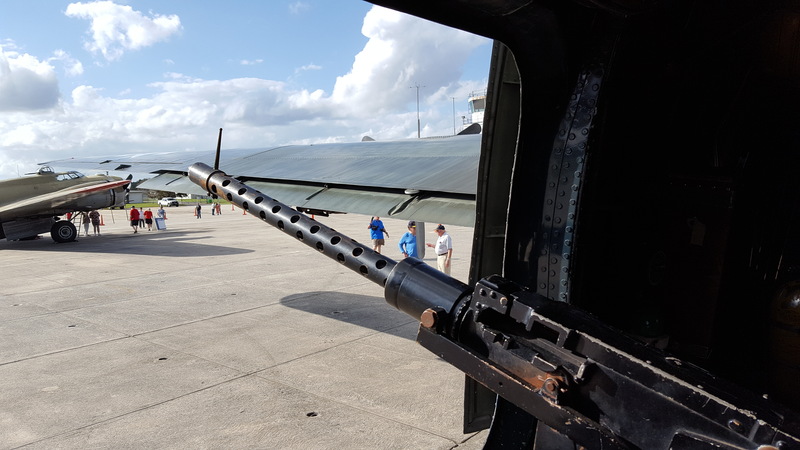 A B-24’s tail with its 50 caliber machine gun shows the cramped, awkward space occupied by the tail gunner. 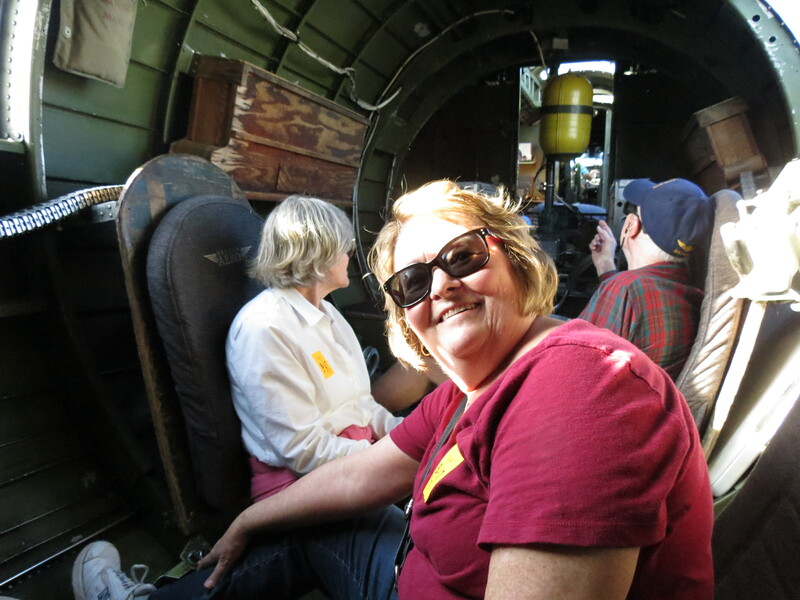 I enjoyed sitting in the tent watching and hearing the crew briefings before they embarked on a bombing mission. 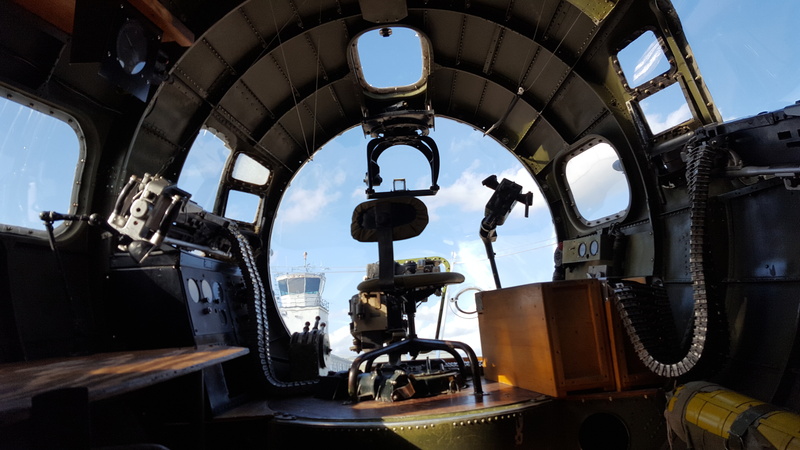 The equipment, uniforms, various insignia and personal memorabilia of many of the squadrons, both bombers and fighters, were displayed in a series of glass cases. Another fascinating section was the replica of a German prison camp where 8th AF crews that had been shot down were held. Stories of evasion and escape as well as artifacts and pictures of those interred help the visitor understand the experiences of the prisoners. 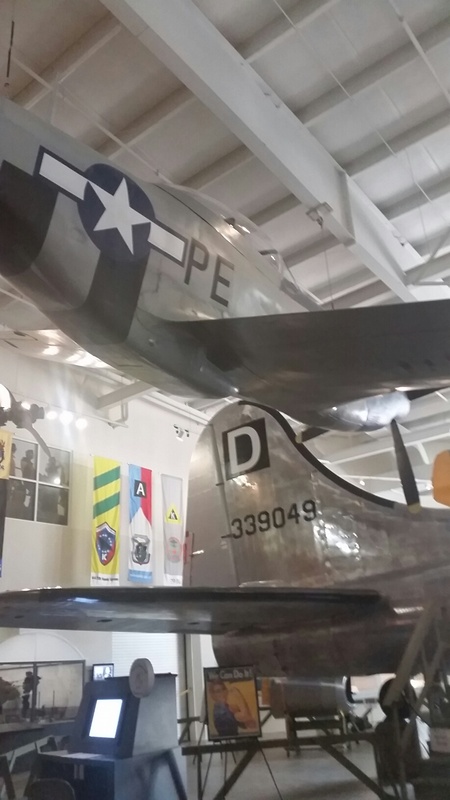 I don’t want to give the impression that the 8th AF Museum only deals with World War II. Other exhibits tell of Korea, the Strategic Air Command and the conversion to jets. 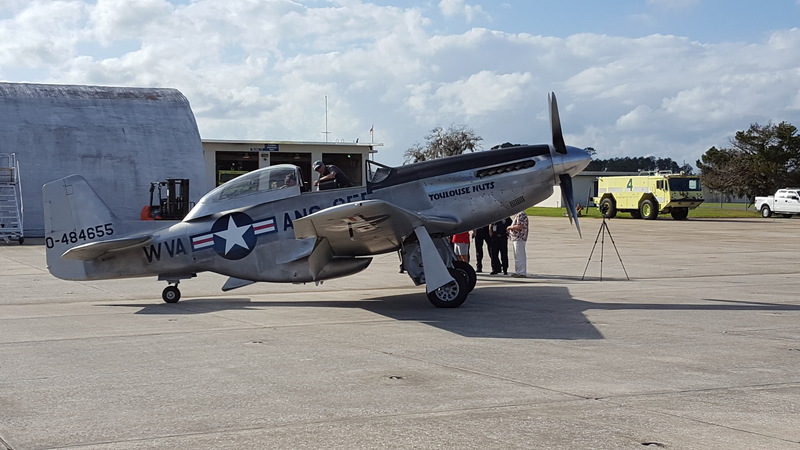 Additional exhibits honor the Tuskegee Airmen, the women of the WASP (Women’s Airforce Service Pilots), an art gallery and even the girl scouts. Outside we found even more. 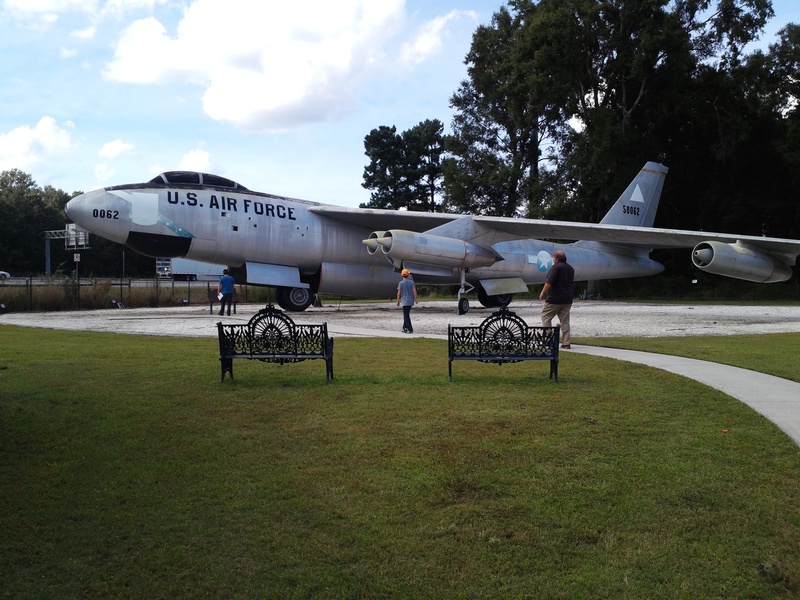 A B-47 Stratojet sits beyond the grounds of the Memorial Garden. A replica of a British chapel provides a place for quiet reflection similar to that available to the men of the Mighty 8th while in England. Out front an F-4C Phantom Jet and a MIG 17-A stand guard. By the end of our allotted time my husband and I both agreed that we had to come back. We felt we had only skimmed the surface of the vast amount of information available. When we return we will be armed with the names of at least two WWII 8th AF veterans who lived in our home town. We will also plan to stay overnight in one of the nearby motels so that we can spend as much time as possible in the museum. For anyone interested in World War II, the history of the Air Force or of aviation, this is a must-see museum. 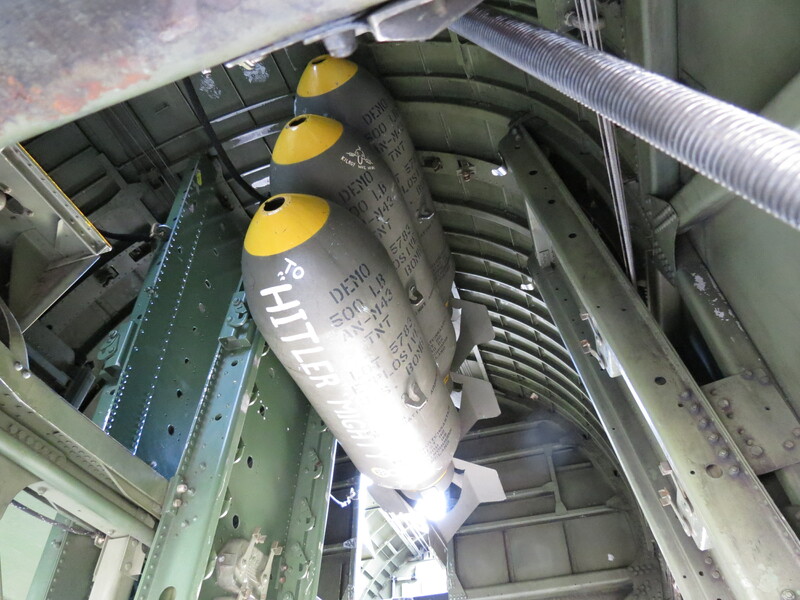 During WWII, the two bombers that carried the load in European air war for the Americans were the B-17 Flying Fortress and the B-24 Liberator. In my latest work-in-progress I am trying to decide which airplane my hero/navigator would have flown. 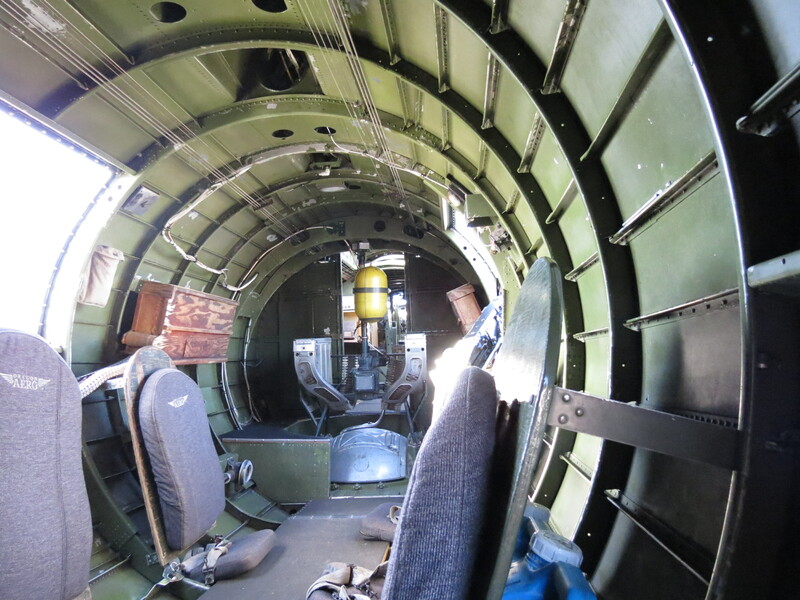 My first thought was to use the B-17 since it seemed more glamorous, but with more research about both planes, I found that the Liberator was quite a plane, too. 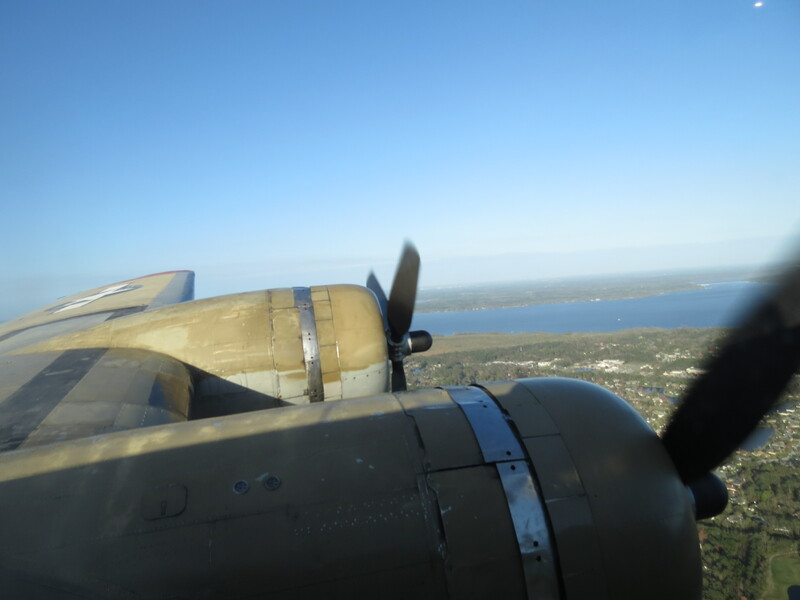 After all, Jimmy Stewart flew the B-24. How’s that for glamor? 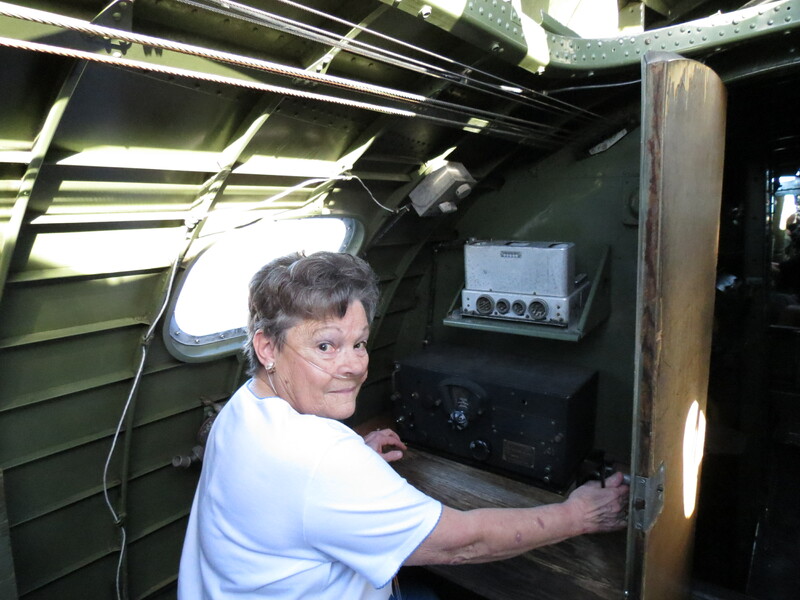 Almost everyone has heard of the iconic B-17. 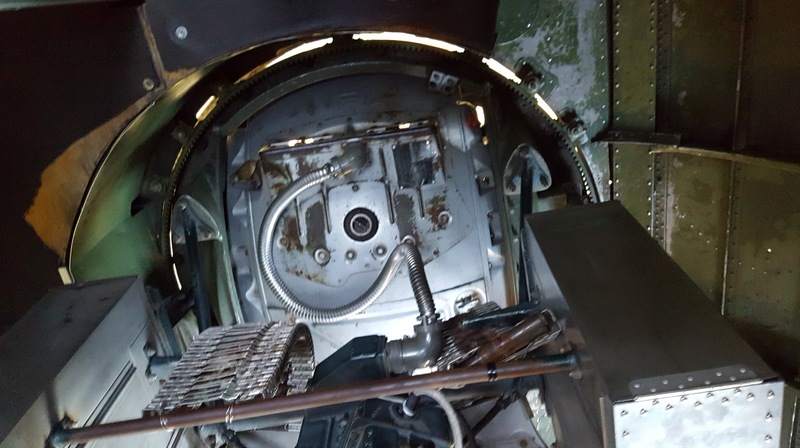 When we think of bombers of that era, images come to mind of planes shot full of holes, with sections blown off and engines not functioning, yet landing safely on air fields in England. Those images are usually of B-17’s. 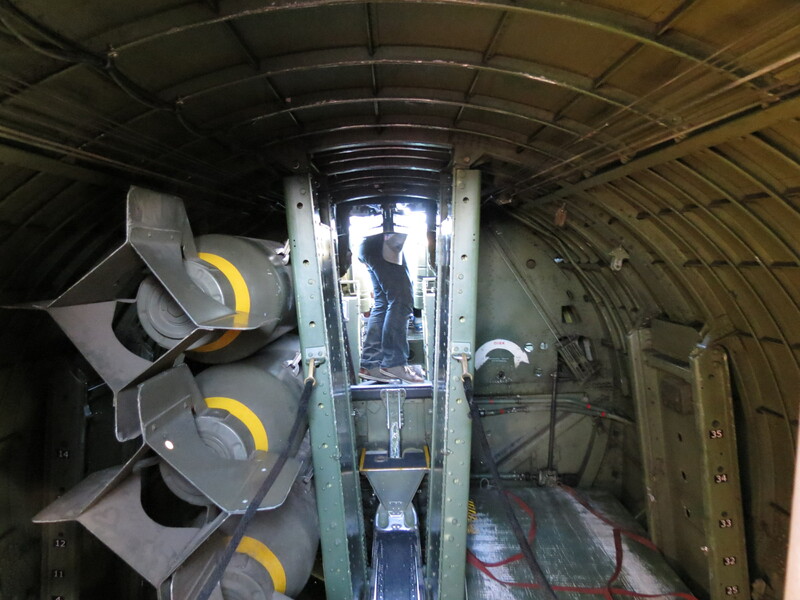 Its crews loved the Flying Fortress because it took lots of damage and still brought them home. 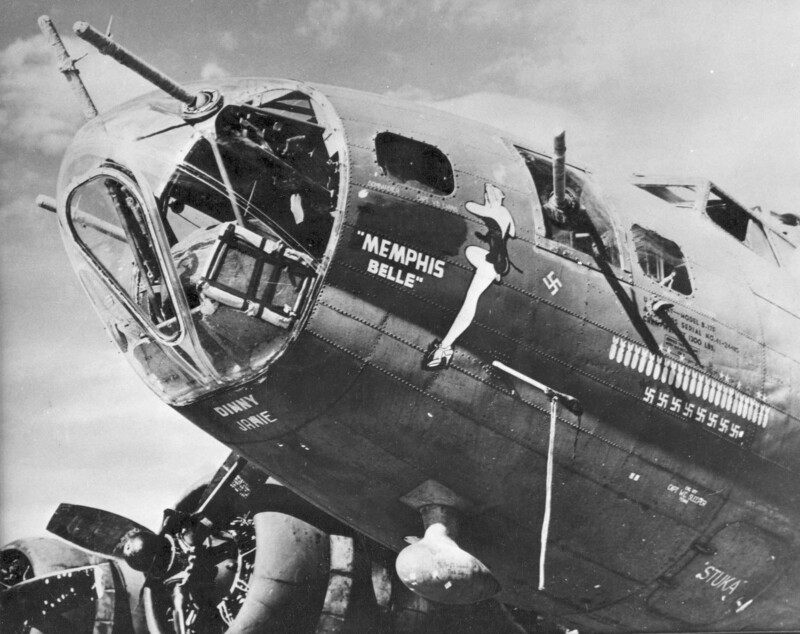 Anyone remember the Memphis Belle? 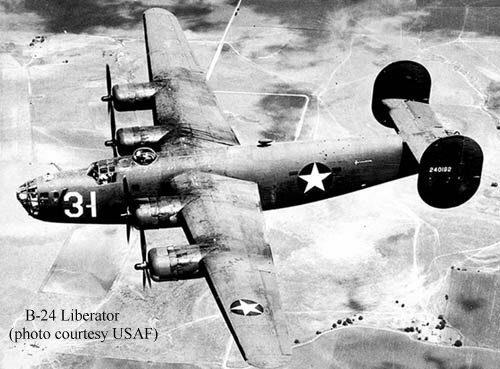 It was the first bomber that finished the required 25 missions in 1943. (Mission requirements were increased to 30 and then to 35 in 1944) Major William Wyler, the famous director and movie maker, as part of the First Motion Picture Unit of the US Army Air Forces, directed a film depicting the final flight of the Memphis Belle. 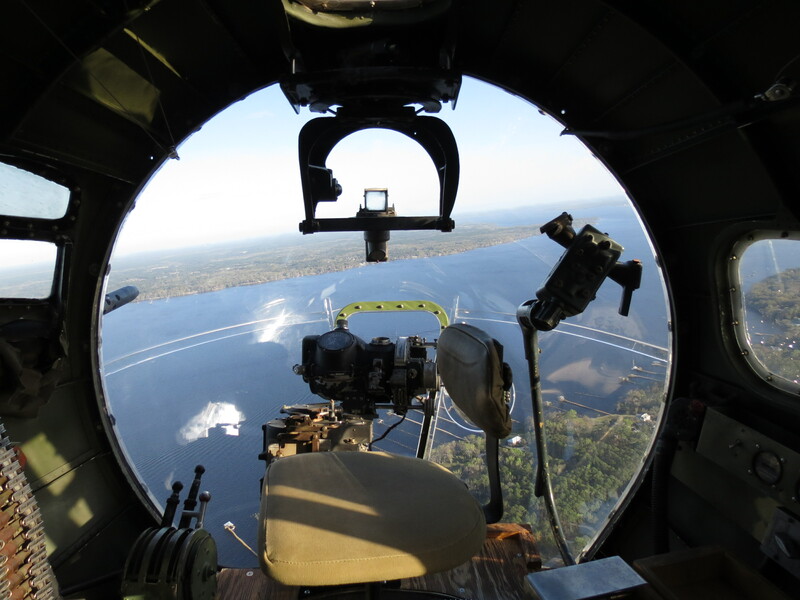 The footage became the documentary “The Memphis Belle: A Story of a Flying Fortress.” As a morale booster for the Army and the folks back home, the crew, the plane and the movie toured the US selling war bonds and recruiting flyers for the Army Air Force. 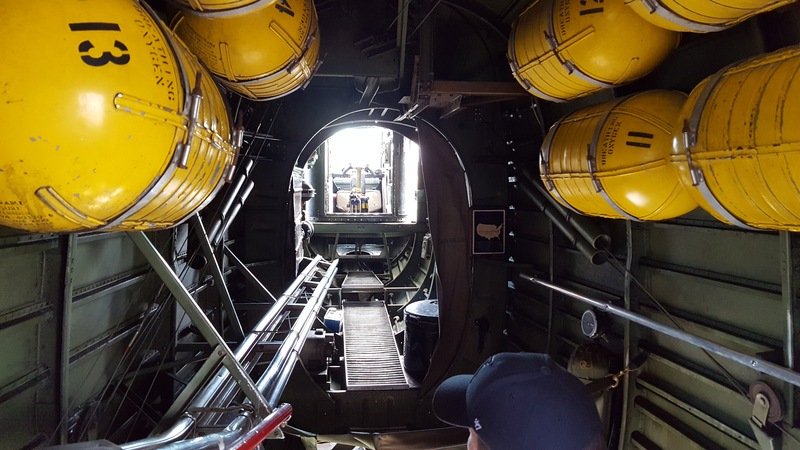 In 1990, Hollywood made a movie about that last flight, “The Memphis Belle.” Both films depict the lives of bomber crews in WWII and are well worth seeing. 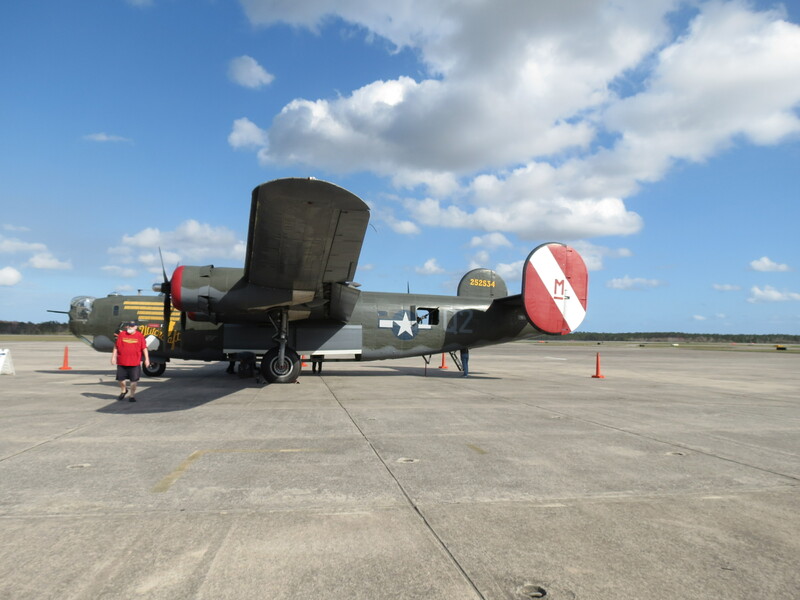 But what about the B-24 Liberator? 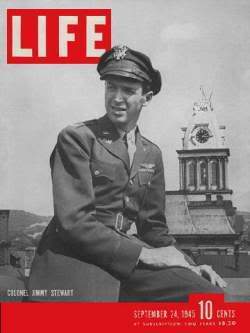 In researching accounts of WWII bomber crew members, I discovered that Jimmy Stewart (Yes! 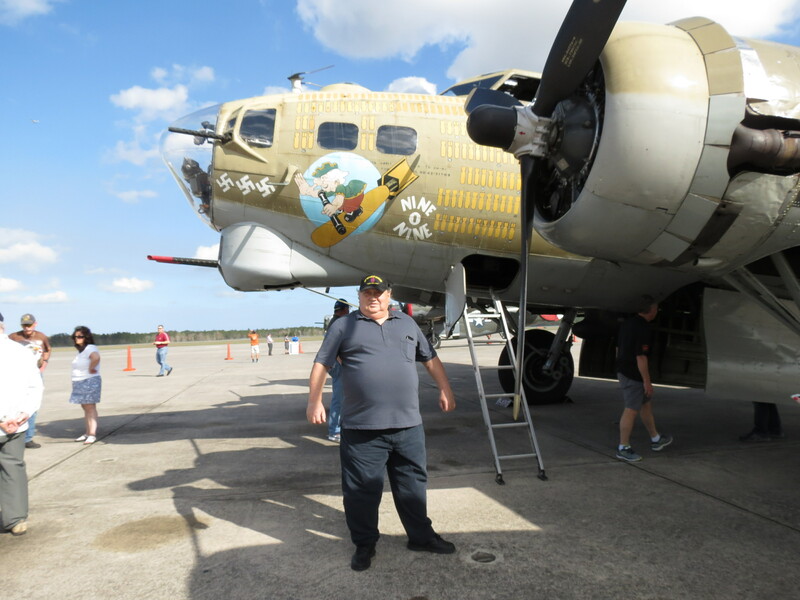 the movie star) flew combat missions over Europe in B-24’s. Starr Smith wrote in “Jimmy Stewart Bomber Pilot”about Jimmy enlisting before the war even started. 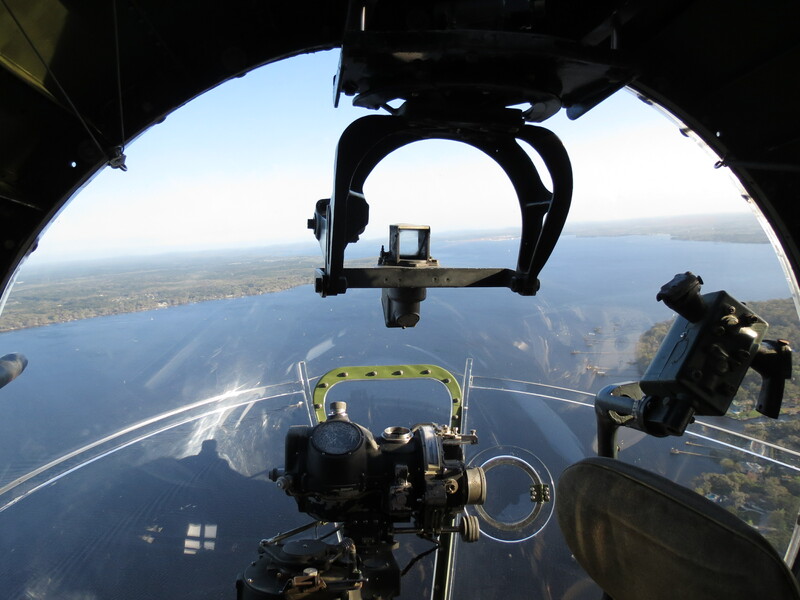 He earned his wings and became an instructor flying B-17’s. Apparently the military feared Stewart would be harmed if sent overseas, which frustrated Stewart. 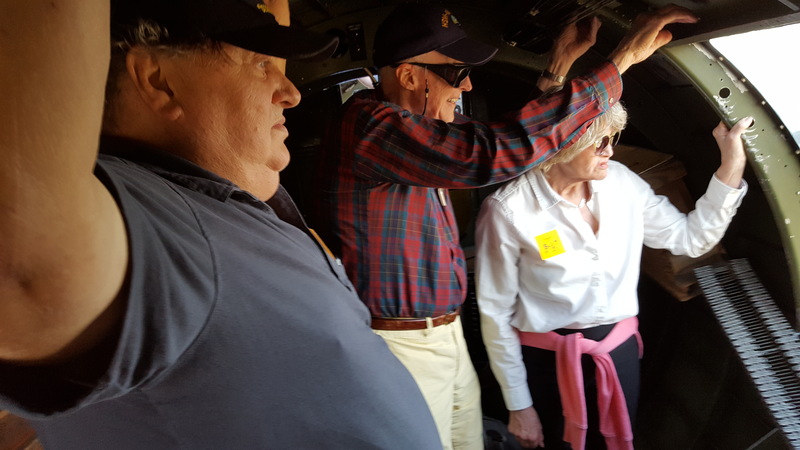 Finally in 1943 his wish for combat duty came true with his assignment to the 445th Bomber Group, part of the Eighth Air Force. 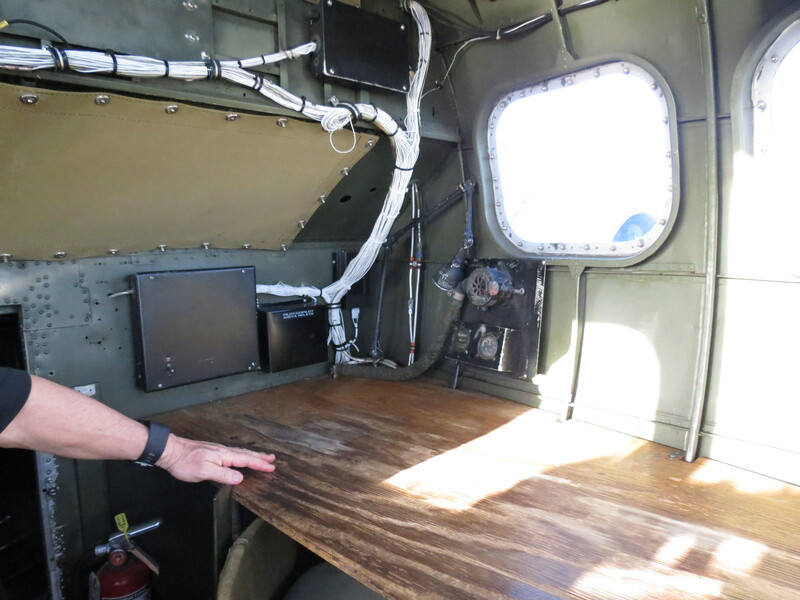 He quickly learned to fly the B-24 and within months received orders for England. Captain Stewart commanded the 703rd Squadron of the 445th Bomber Group and regularly flew combat missions. Promoted to Major and transferred to the 453rd Bomber Group as Operations Officer, Stewart continued to fly combat missions, including flying on D-Day (June 6, 1944). In July 1944, Lt. 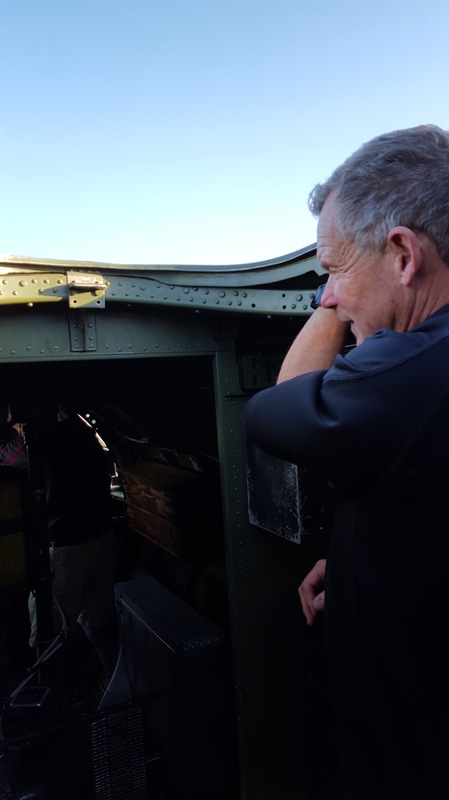 Colonel Stewart’s transfer to Second Combat Wing Headquarters severely limited his combat flying. In his twenty-three months overseas, Stewart flew 20 combat missions over Europe, all in B-24 Liberators. Data for a head to head comparison of the B-17 and the B-24 can be found on several websites for anyone who likes statistics. 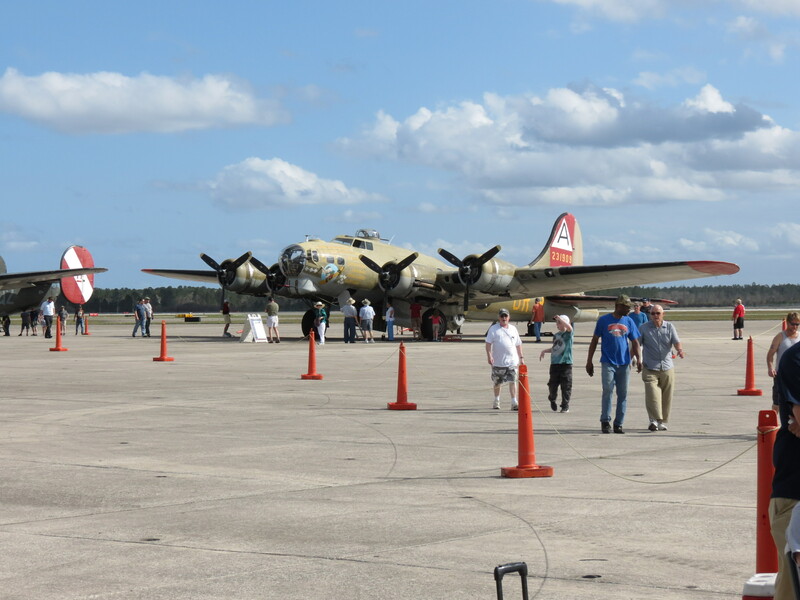 One interesting difference I found was that the B-17 was slower than the B-24. The difference in speed meant that the two bombers could not fly in the same formations, although they were often sent on the same missions. 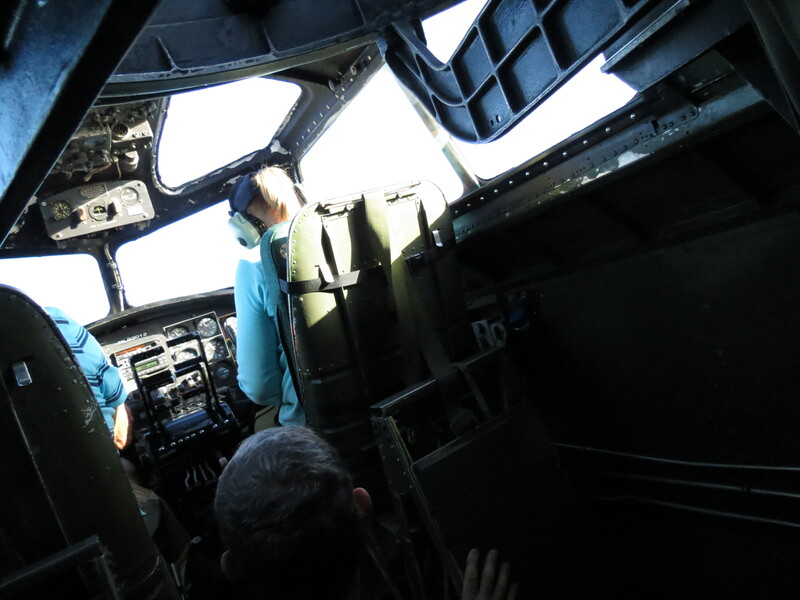 But the B-17 could fly at higher altitudes. 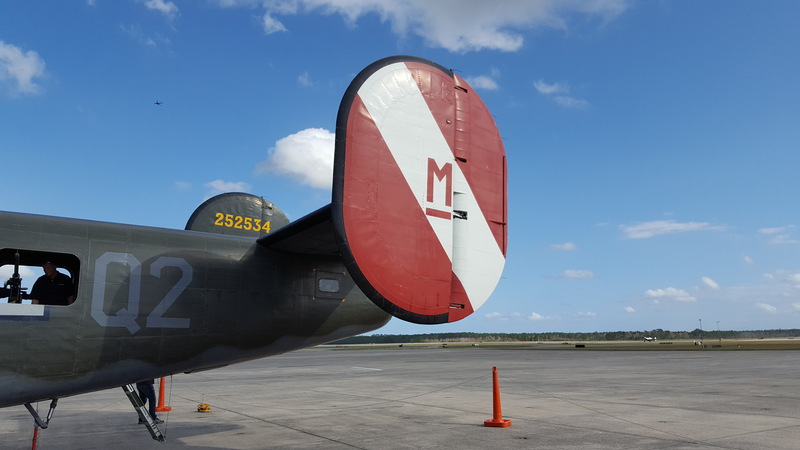 There is no doubt that the Flying Fortress crews and the Liberator crews each believed their plane the best and maintained an ongoing, good-natured rivalry. 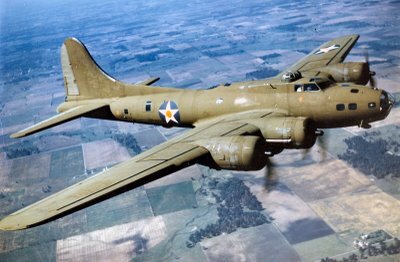 Some believe that the B-17 got better press during the war and many thought it a better looking plane. It is definitely the one most people associate with WWII. So, which plane will I use in my book? I haven’t decided. But I’m leaning toward the B-24 because it’s less known and because I have found some good books to use as reference material. Among them are: “A Reason To Live” by John Harold Robinson who flew as a gunner and engineer on a B-24; “Lucky Penny’s Tail” by Gregory J. Matenkoski recounting the story of Edmund Survilla, a tail gunner on a B-24; and “Jimmy Stewart Bomber Pilot” by Starr Smith. For additional research, I plan to travel to Savannah, Georgia, to visit the Mighty Eighth Air Force Museum sometime in the near future. 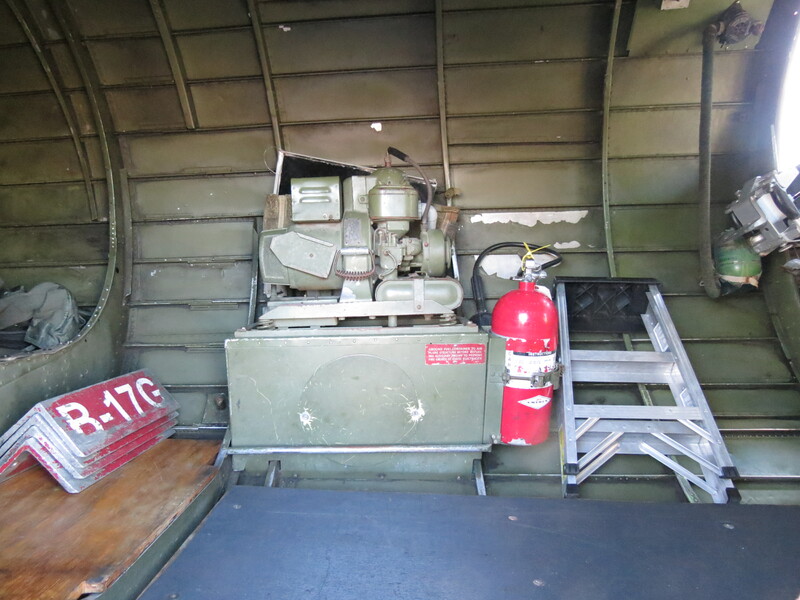 This museum should give me additional details and insight into the WWII air war. Wouldn’t I love to take a ride on one of those old planes? I’m watching for an opportunity.